This blog has suffered from a slow start to which I apologise. Hopefully this large slew of pictures and progress should make up for my lackluster posting in the first week or so, hope you enjoy. 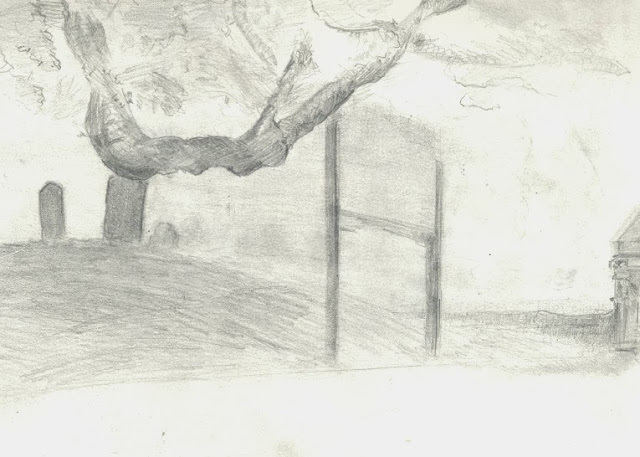 So first, landscape drawing. For the first week of landscape drawing we went out with Jack Greasley to draw the River Soar by the university and practise single point perspective. 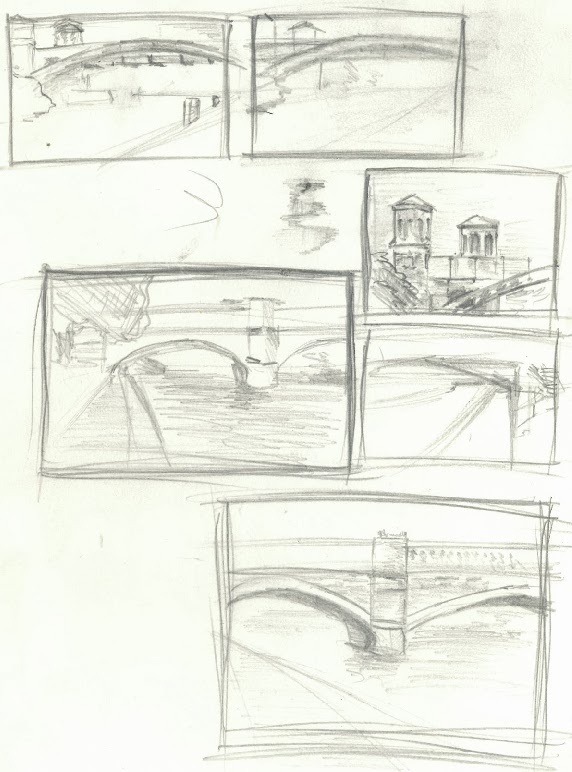 We drawn thumbnails in order to capture the horizon line and vanishing point and then used these thumbnails to develop a final. 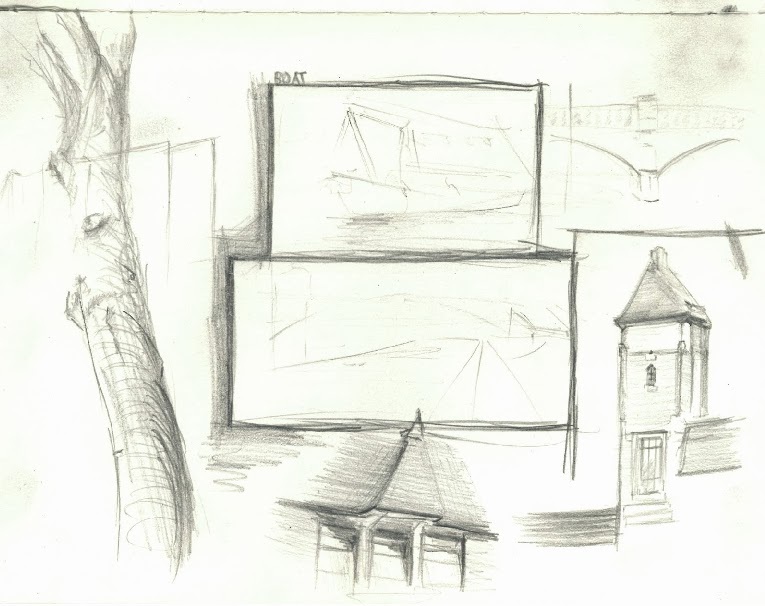 For the first week we were just getting into things so I might come back and do some more drawings of the river later down the line, also below is some landscape sketches from freshers week as I thought they might be good to drop in. 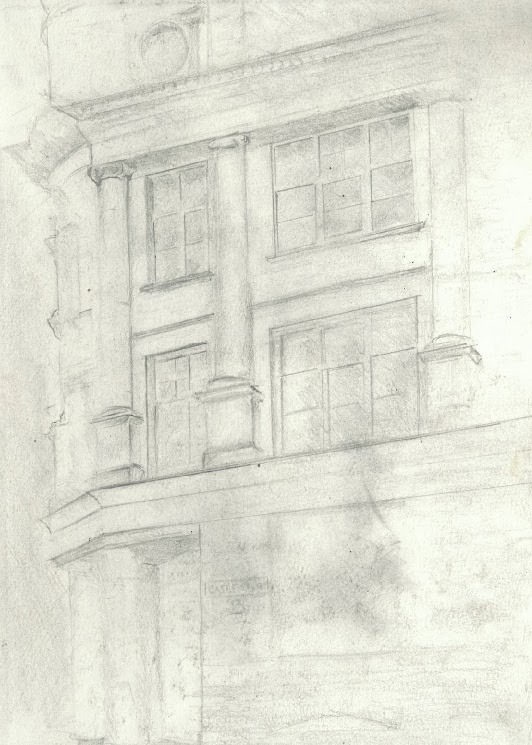 This drawing is of the lovely view from my ground floor room in Victoria Halls. 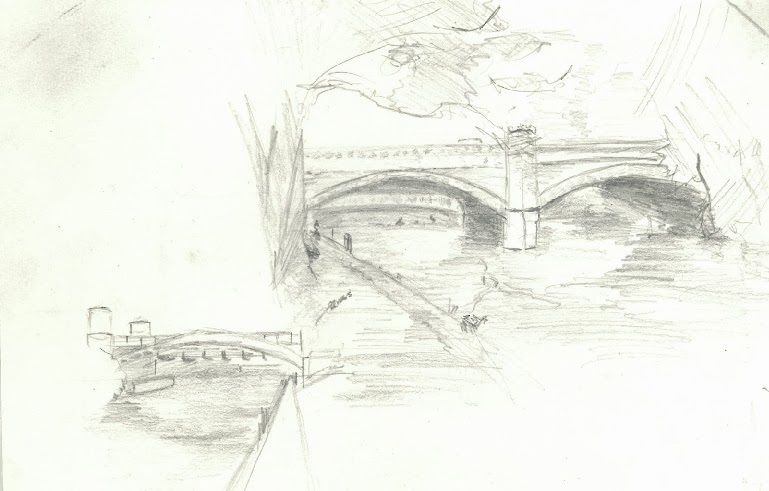 I wanted to get some quick drawing done during freshers so I was still productive. This drawing I also did during freshers of the graveyard and church opposite Victoria, when the course starts you will see a marked improvement. First Page of thumbs, just getting to grasps with the perspective. 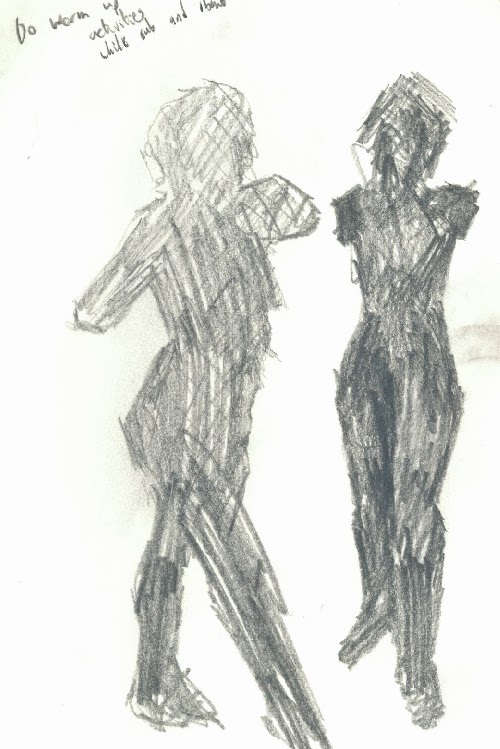 Slightly more detailed thumbs. Next time I'm going to try and do a few more really basic thumbs to block things in a bit more. More thumbs, trying out some reflection shading aswell. Here is my final for the week, I decided to go for the more industrial looking bridge as I found it a bit more challenging and interesting to look at. I thought I would include at least one swan in the final since it became a bit of talking point during the week. 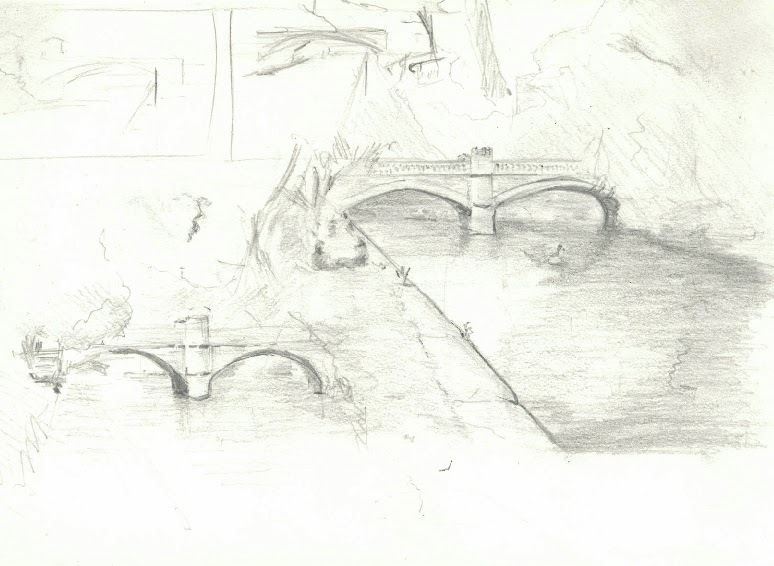 Here is my final for week 1, done using a 2b and 4b pencil, next time I will go a bit darker but this final was just testing the waters. 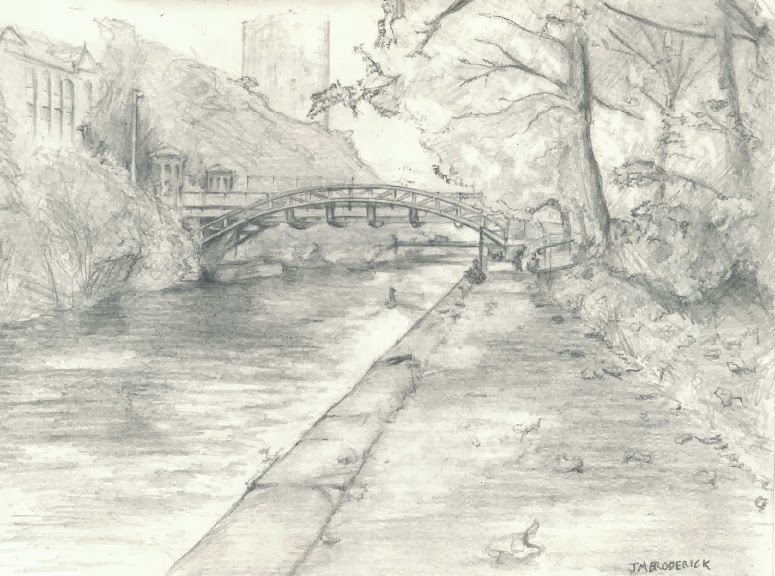 I was exhausted at the end after sitting on the pavement getting shouted at by cyclists all day but I am pleased with the result, next time though I will work on improving my rendering of foliage and concentrate on the shadows more so the drawings have a bit more depth to them. 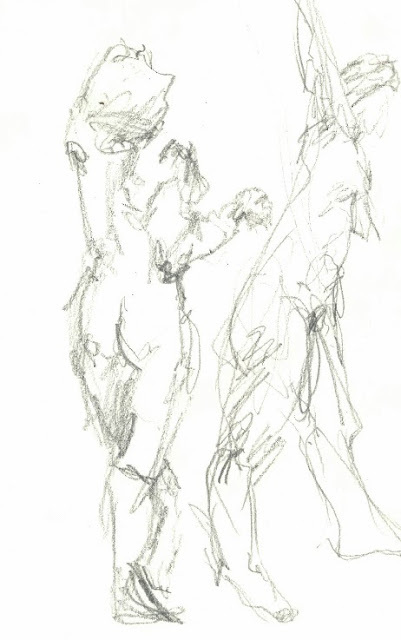 We then did life drawing in the afternoon with Heather, as I haven't done life drawing for a couple of months it was nice to get back into it and I come out with some nice results. I especially enjoyed the exercises we did at the start with the continuous line and opposite hand drawings as I did them in college and we didn't have much guidance but with Heather helping us along those drawings come out surprisingly nice and I'm going to make an effort to start doing some in my own time. Right hand drawings - It was quite surprising how these turned out as these were opposite hand, I might get in the habit of doing these a bit more. 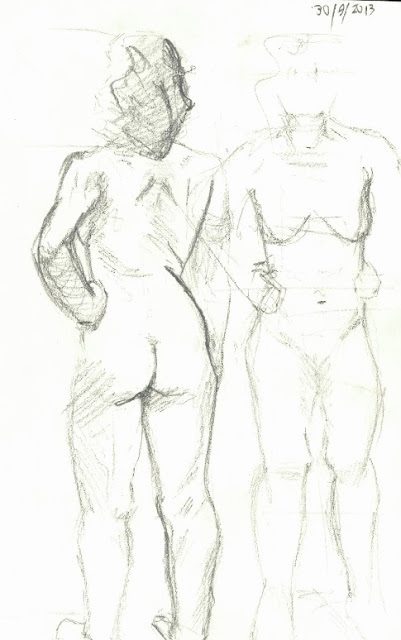 Silhouette sketches, handy for helping think about the form a bit more. I didn't like how I did the face on this one, reminds me of Nicolas Cage a bit. 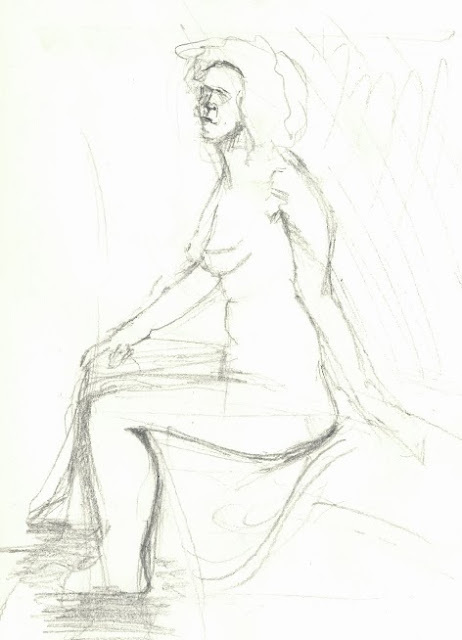 Another standard life drawing, this one turned out pretty decent aswell in my opinion. Ok that's it for now, week two stuff should be on here tomorrow which includes drawings I've done of the archway on Castle View before the heavens parted plus some random doodles of dragons and 3d texturing work for the week. I look forward to sharing more stuff.